Blueberries are Full with vitamin C.
How about getting 14 mg of Vitamin C in just one serving , almost 25 percent of your daily requirement. Vitamin C aids the formation of collagen a important role Player for Bautifl Skin and helps maintain healthy gums and capillaries . It also promotes iron absorption and a healthy immune system which in turn keeps you away from illness. Blueberries are good source for Dietary Fiber . It is known that most of us don’t get enough fiber in our diets or the diet which we take does not fulfill the required amount of dietary Fiber required by our Body. Eating foods high in fiber helps your heart healthy and your cholesterol level within limits . A handful of blueberries can help you meet your daily fiber requirement. A simple and a tasty way to eliminate this worry from your day. 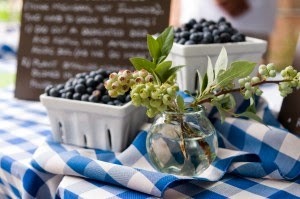 Blueberries supplements the manganese requirement of our Body. Antioxidants are required to neutralize free radicals,unstable molecules linked to the development of cancer, antioxidants also are needed to control cardiovascular disease and other age-related diseases such as Alzheimer’s. Bluebrries have a substance called polyphenols, specifically the anthocyanins that give the fruit its blue hue these are the major contributors to antioxidant activity.